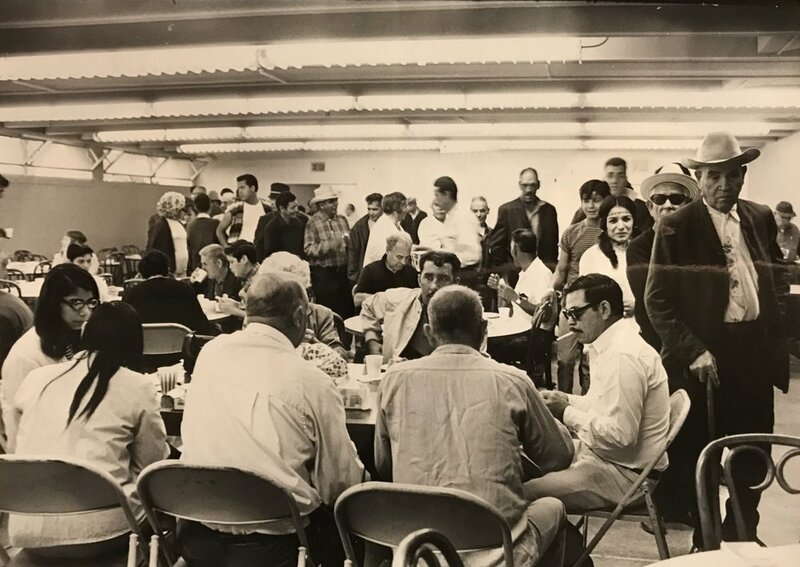 #OTD 24 May 1968 Nicholas P. Garcia (Denver, CO), on the left, and Amas Lucero (New Mexico), two members of the delegation of Mexican Americans who traveled from western states for the Poor People's Campaign (PPC), eat breakfast at the Hawthorne School (501 I St SW). Instead of staying at Resurrection City on the National Mall, the delegation stayed at the Hawthorne School, an independent, progressive school founded by Eleanor Orr and Sandy Orr (both white). Hawthorne School student John Duesenberry (white) remembers the delegation. "In April, Sandy and Eleanor announced that marchers would be staying at the school. The marchers that I remember were a...delegation from New Mexico. They were members of the Brown Berets. I don't remember seeing a lot of the marchers at the school. They mostly came at night and crashed. One of the delegation leaders was Corky Gonzalez and I remember him giving a talk in front of the whole student body and faculty." Your comments are welcome below. Do you, a family member or neighbor remember Nicholas Garcia and Amas Lucero? Were you part of the Mexican American delegation? Do you recognize anyone in the second photo? Were you a student, staff or faculty member at Hawthorne? You may comment privately here. Photo source: Courtesy of DC Public Library, 24 May 1968. Silverman, photographer. Gordon Mantler. Power to the Poor: Black-Brown Coalition and the Fight for Economic Justice, 1960-1974. 2013.